Summer wanes, but heat persists. The days grow shorter, nights are longer; all are cooler. Rain falls, gently, but also in sheets and deluges. Here in Central Texas, September weather conditions tend to the transitional and this past month certainly bolstered that weather paradigm. Summer 2017 is now in the history books and autumn will write its own story. 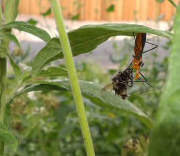 But no matter the conditions, garden wildlife continue their activities: eating, dying, growing, defending, migrating. Today is the first Wednesday of the month and time to appreciate those with whom we share space in the wilds of our gardens and neighborhoods. 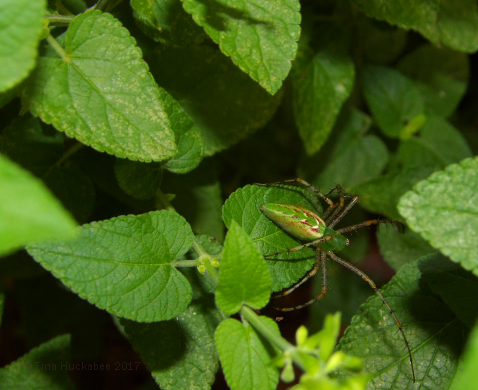 …a Green Lynx Spider, Peucetia viridans, for a couple of weeks. She perched atop a White tropical sage, Salvia coccinea, successfully hunting various pollinators who happen her way while going about their own feeding business. She snagged a Horsefly-like Carpenter bee, Xylocopa tabaniformis, and while I angled for a photo, the startled spider dropped the bee onto a leaf below the spider’s lair. 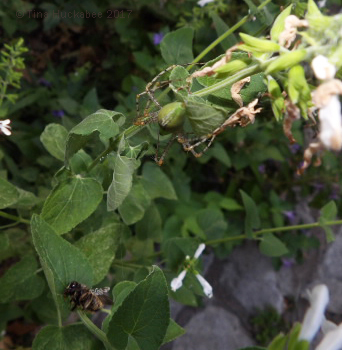 Not willing to lose out on a juicy bee, Ms. Spider makes her way along the stem to her repast. 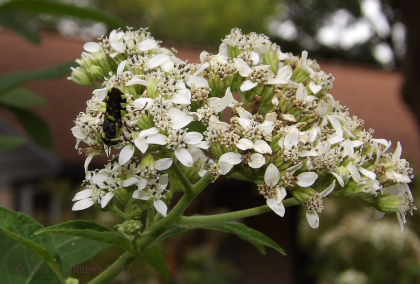 Sniff–the X. tabaniformis bees are my favorite bee species and I hate to see one of them become someone’s meal. 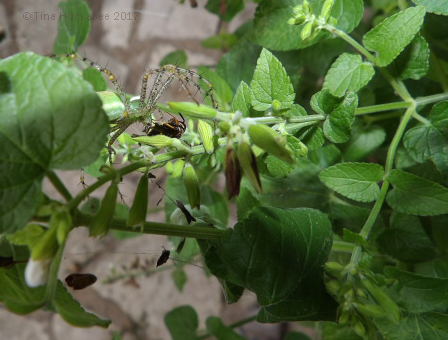 But everyone must eat, including garden spiders, and that’s the way of wildlife–and wildlife gardening. This little bee, perhaps a Sweat bee, Halictus tripartitus, and another common native bee in my garden, also fell victim to the spider’s appetite and hunting skills. Another sniff by me. Well, it can’t always be bad insects that are eaten. I had words with Ms. Spider about expanding her food repertoire, but she remains on the Tropical sage, hunting and eating her fill. 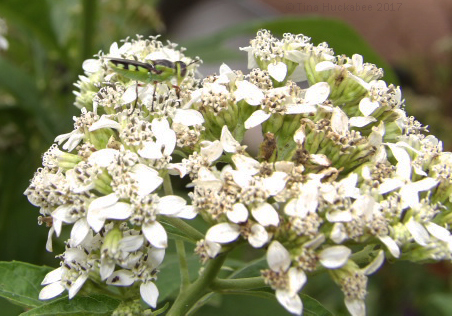 On this Frostweed, Verbesina virginica, a Milkweed Assasin Bug, Zelus longipes, demonstrates its hunting prowess. 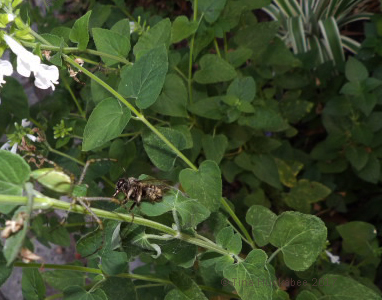 The snared snack is yet another Horsefly-like Carpenter bee. 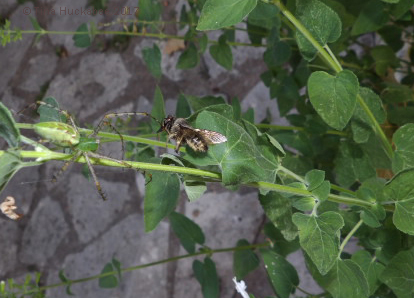 There are lots of these bees in my garden, so it makes sense that some are going to become prey for hunters. I wish I could warn the bees about the impending danger lurking amongst the flowers, but they’re on their own in the big, bad, dangerous garden-world. Frostweed, V. virginica is the best, THE BEST, pollinator plant in my garden. When it blooms each autumn, I’m always amazed at the variety of insects partaking of its bounty. Each blooming season I see and learn about new-to-me pollinators by watching what visits the Frostweed flowers. 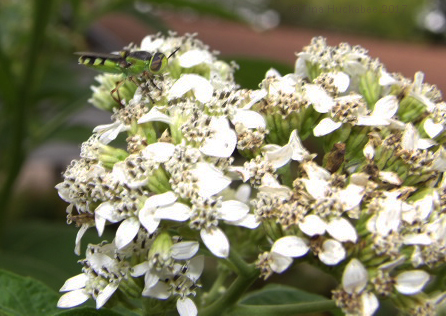 He/she is a Soldier fly, Odontomyia cincta. No doubt my garden has benefitted from this insect before, but I’ve never seen one. Turns out that the larval form of this insect is aquatic; the adults feed on nectar, the larvae feed on algae. I have a pond, as do several neighbors, so it’s a wonder that I’ve never seen this gorgeous insect before. I can’t decide if its coloring is akin to the loud clothing combos of a golfer or the eye-popping garb of a disco dancer, but I’m sure glad this one came by for a sip so that I could admire its kelly green-and-black striped costume and deep maroon eyes. 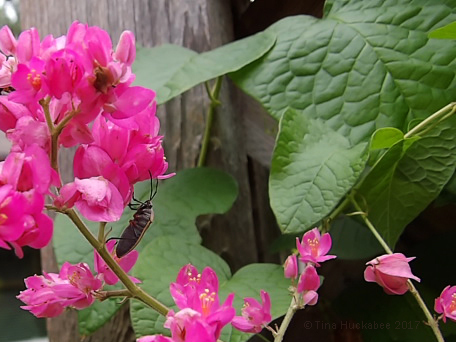 Another stellar autumn pollinator plant, the Coral Vine is beloved by honeybees. The vine is currently in motion with the buzzing activity of huge numbers of honeybees working these sweet blooms. I haven’t posted recently about the resident Green Anole, Anolis carolinensis, lizards in my garden, but there are plenty of them around, eating anything smaller than themselves. Hanging out on the front wall of the house, neither green nor brown is particularly effective camouflage. This one was in brown-to-green transition as he looked warily at me, assuming some invasion of his territory. He has nothing to fear from me–I love these little ones and am happy they like my gardens. This very little one is obviously a juvenile, at only about 2.5 inches in length, compared to the 6 or 7 inches for adults. 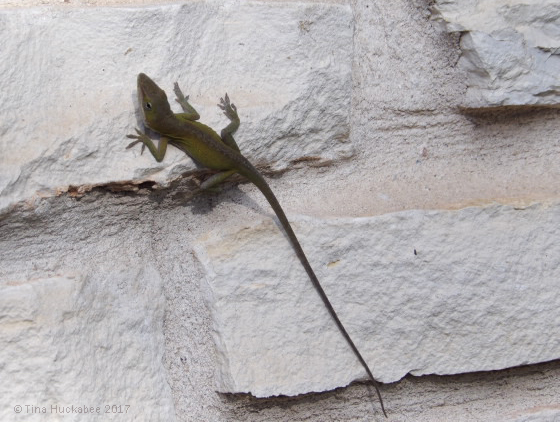 In late summer and early fall, it’s common to spot these teenage anoles. They’re even cuter than the adults. Bird migration was a big win in my garden during spring, but there has been little migratory movement through my garden this past month. I spotted what I think was an Eastern Phoebe and another bird who was yellow with wing bars–that describes quite a few migratory birds, but that’s the extent of bird migration action. This juvenile (?) 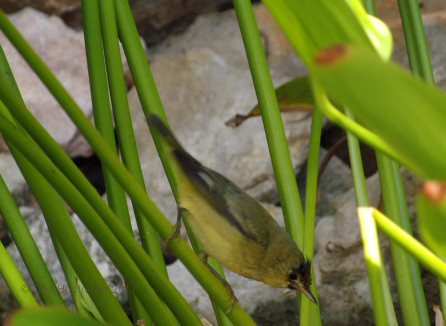 Wilson Warbler, Cardenllina pusilla, enjoyed the pond and also picked insects from the Yellow bells, Tacoma stans and the Autumn sage, Salvia greggii. I hope the migrating song birds are simply finding more amenable conditions west or east of my garden. Hummingbirds were a constant this summer and there are still a couple of them around, chasing one another and fueling up for migration to Mexico and Central America on their favorite nectar plants. She can’t decide which Turk’s cap blooms (Malvaviscus arboreus) to feed from. Female Black-chinned Hummingbirds, Archilochus alexandri are the most common hummers that I see. I’ll miss their zooming antics, territorial squabbles, and annoyed, bossy chirps when they finally decide it’s time head south–which will be any day now. Transitioning from summer to autumn provides interesting viewing of common and uncommon critters, while enjoying more pleasant temperatures. I hope your garden is full of wildlife happenings and ready for autumn color. Please share your wildlife stories for this past month and remember to leave your link when you comment. Good wildlife gardening to you! This entry was posted in Uncategorized and tagged Black-chinned Hummingbird, Green Anole, Green Lynx Spider, Largus Bug, Milkweed Assasin Bug, Soldier fly, Wilson Warbler by Tina. Bookmark the permalink. You have a nice collection of wildlife and it is hard to believe there are so many bugs left with all the predators. I’ve had a new batch of hummingbirds that are constantly fighting. There have also been several turtles in the yard that I will be posting about later. Lots of bugs! I’m amazed that the hummers are still here–I was just watching one nectar at a Turk’s cap. I look forward to reading about your turtles–not something I tend to see in my ‘hood. I love your attention to detail and your patience….it takes a lot of patience to photograph insects and wildlife. And your photos are great. Thank you, Robin. I wish I had just a bit more patience, and maybe a better camera for the bird shots–those are difficult. I have enjoyed learning about the many critters in my midst. Oh, that spider is beautiful! The hummingbirds are sparse here now, but I’m still noticing a little action at the feeders. Thanks for sharing your wildlife photos, and thanks for hosting! Here’s my post: https://plantpostings.blogspot.com/2017/10/candids-of-katy-in-tropical-terrain.html. I was concerned for the spider! … losing her meal. It’s funny how we see these things. I think I root for spiders because so many people have such a strong and needless bias against them. Oh, ticks! I had seen precisely two ticks in all my time outdoors until yesterday, when I carried four home with me from the Brazoria refuge. I couldn’t believe it. Now, I have to go over my car interior with that proverbial fine-tooth comb to be sure I’ve gotten them all, and I’ll have to keep an eye on things for a while, since I found one on the passenger seat yesterday. Yeeech! It’s time to get out the Permethrin clothing spray and treat some clothes. Various nature photographers I know swear by the stuff. The nice thing is that it lasts through four or five washings, and it’s far better than risking in-the-field spray products getting on the camera. I’d try organic, but I’ve had friends mix up several recipes and still be bothered, so I’m going to experiment with the Permethrin. I’ve used organics for mosquitoes with success, but I just don’t feel like messing with ticks. Do you have a favorite way of defending against them? Ooooh and yuk! I hate those blankety-blanks! Fortunately, I rarely see ticks. The last time I had a run-in with them was on a hike to a nearby state park and we picked up some of the free-loading, blood suckers. Vacuum, vacuum, vacuum. I’m not out in the field much, and I detest chemicals, but that sort of thing is necessary when it comes to areas impacted by disease vectors. I’ve always had trouble breathing when I use DEET for mosquitoes. When I worked at Zilker Botanical Gardens here in Austin, I found a repellent called Repel, which is a commercial blend of lemon and eucalyptus. I spritz it on my hand and rub on expose areas. It’s worked well for me, though I go around smelling like a big, lemon pie–I suppose there are worse things that I could smell like. 🙂 Ticks=gross. Tina’s pictures are magnificent. The Green Lynx Spider is beautiful. 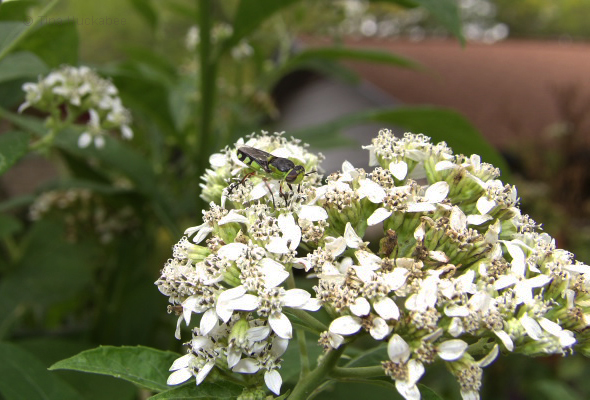 Frostweed flowers are beautiful and the soldier fly that is in them is very pretty. The Green Anole is one of my favorites: when I see it in my garden I stare at it for a while. I love birds. And all the plants are beautiful. Tina has a gogeous and very special garden. Greetings from Margarita. Thanks, Margarita. The Lynx spider really is lovely–there have been several in my garden this summer; I’ve enjoyed watching them. 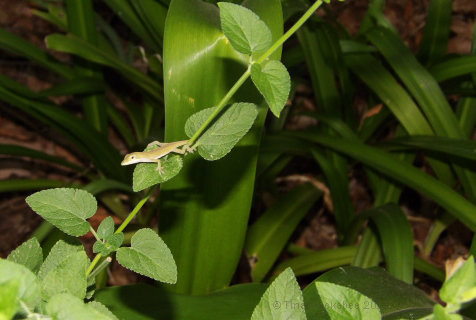 I also adore the Green anole–they’re charming lizards, so fun in the garden! You’re welcome, Rebecca–thanks for reading and joining in with Wildlife Wednesday! Wildlife Wednesday is always a treat in your garden. I need to get the hummer feeder back up. Took it down to clean several weeks ago and the hummers seemed to find plenty to eat in the garden. Need to check the frostweed for visitors soon. I seem to have just enough to satisfy the hummers (are they ever really satisfied?? ), that I don’t put up a feeder. They’re fun to watch, to be sure. Thanks so much! I often hope that the migratory birds and monarchs have visited the gardens of the northern bloggers I follow. A nice synchronicity. Fantastic photos of the lynx spider Tina, I love the colour and detail. And great shots of the hummingbird. I imagine they must be difficult to get good photos of since they are so fast. As you transitioned into autumn, we here in Australia transitioned into spring. Here’ s my contribution this month. Yes, spring is springing for you! How nice and I’ll bet it’s lovely. 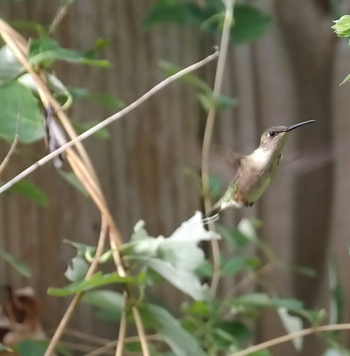 Yes, I have neither quite the skill or camera to effectively capture the hummers. But I still love to watch them and they’re obliging that by staying around. The spider was gorgeous. I haven’t seen her in a couple of days, I’m hoping she’s moved on, but it might simply be time for her progeny to take over the hunting. Love those last two hummingbird pics! As for the spiders and other predators, they do may be gruesome but it is necessary. Thanks, Jason. 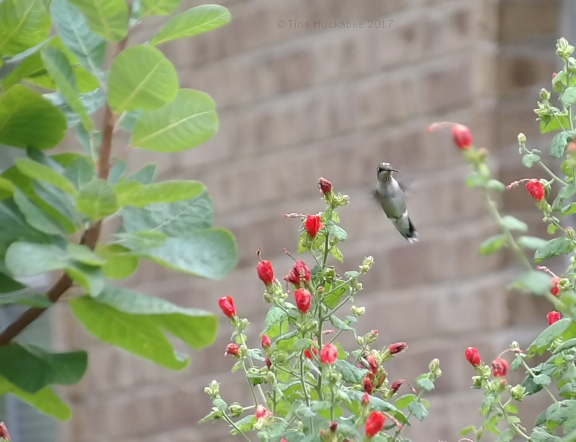 I really have a tough time getting the hummers, but those two shots were…okay. I agree about the spider, they certainly have their place. I am pleased to see your green anoles once again. They seem like mascot material to me. 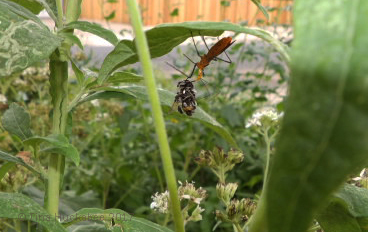 I found the milkweed assassin bug your most sinister picture this time. I am not surprised when spiders are shown with their prey, but that red bug looks worrying! Haha–they are sort of my mascot and I realized that I haven’t taken many photos, though I certainly don’t lack for opportunity. The milkweed bug does look a bit scary–appropriate maybe as we approach Halloween? 🙂 I’m always glad to have your participation, so no worries! The spider photos are wonderful. I’m not sure I’ve ever seen one of those. Crab spiders, now? Those seem to be everywhere, tucked away into the middle of plants, just waiting for their next meal to show up. I’ve not seen any frostweed blooming yet this year, but yesterday I found some bits of blue mistflower, marsh fleabane, and what I think was shrubby boneset. I’m just going to have to make some time to get farther out of my normal territory. The effects of Harvey are even more substantial than I realized — partly because the marshy areas were swept clean of plants that would be blooming now, and partly because the recovery efforts are including more mowing than usual. I suspect some of it’s to get rid of the over-enthusiastic grasses that are home to mosquitoes! Thanks! I’ve had a couple of the green lynx this year, but very few crab spiders. Funny how some years there’s more of one thing, another year, it’s something else. That’s too bad about the open areas, but I guess I’m not that surprised. I know mosquitoes are a problem, but I sure hope not much aerial spraying is happening. It’s so, so bad for the pollinators, and in turn, everything else. They did one big military-grade overflight of many areas (using military aircraft) while there still was a lot of standing water in the marshes and woods, but there isn’t any consistent residential spraying going on. And as far as I know, that first spray was the last. Given the numbers of mosquitos, I think it was necessary. Imagine, if you will, this! It almost makes ticks seem bearable! Yes, I know they were warning bee keepers in the region to cover hives and of course, there are safe–and less safe– ways to spray. I hope the officials chose the former, rather than the latter. That article was something! I’d seen reports about the hordes of skeeters, but the pics are impressive!